A dairy farmer who has been without power since Storm Ophelia hit said the situation was a "nightmare" for farmers as many were struggling to get their cows milked. 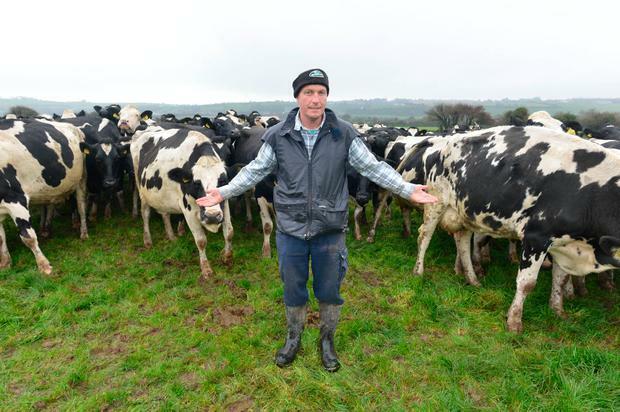 Maurice Smiddy (44), from Ballymacoda, Co Cork, said most farmers in the area were only managing to milk their cows "once every 36 hours". "At the moment, I think all cows have been milked, but that only started happening on Tuesday evening and they're only being milked once every 36 hours as people are sharing generators," he said. While Mr Smiddy's generator is able to cool milk, he said he knows farmers who aren't as lucky and need to get their milk collected by co-ops as soon as possible in order to ensure it is cooled. He added that there was a low mood amongst farmers in east Cork and west Waterford. They had been hoping to produce as much milk as possible to make up for 2016's poor milk price. "2017 was a great year for milk. Milking price was great but I must say there's a very despondent mood among farmers here at the moment. "Many farmers had been trying to make up for last year's losses but they won't have the opportunity to do that now as once cows go down to milking once a day at this time of year, it's hard to get that back up," he said. Calling for more clarity on when power would be restored, Mr Smiddy added: "We've had outages in the past but I've never seen anything like this. Usually power wouldn't be gone for more than 24 hours." A spokesperson for the ESB said:"ESB Networks acknowledges that this is a difficult time for our customers without supply and we are working as quickly as possible to restore supply to everyone."